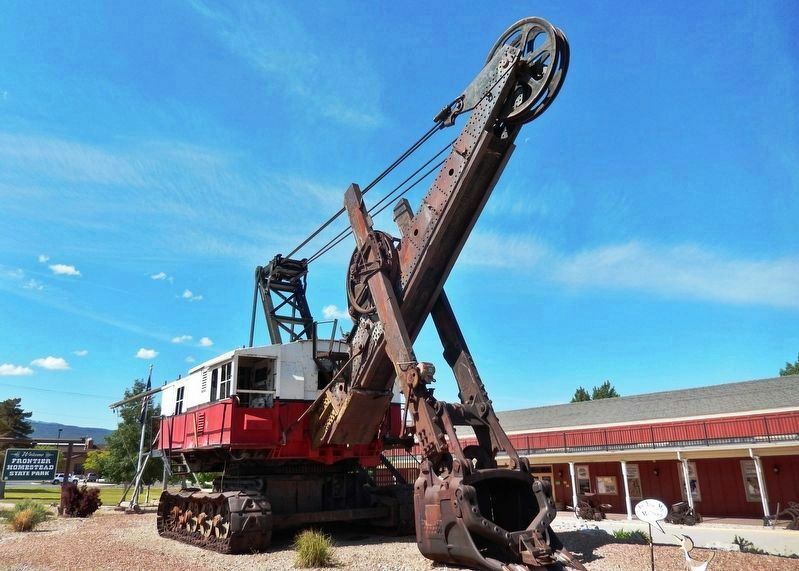 In the 1930s, iron mining expanded in Iron County and massive shovels were needed to excavate the needed ore. 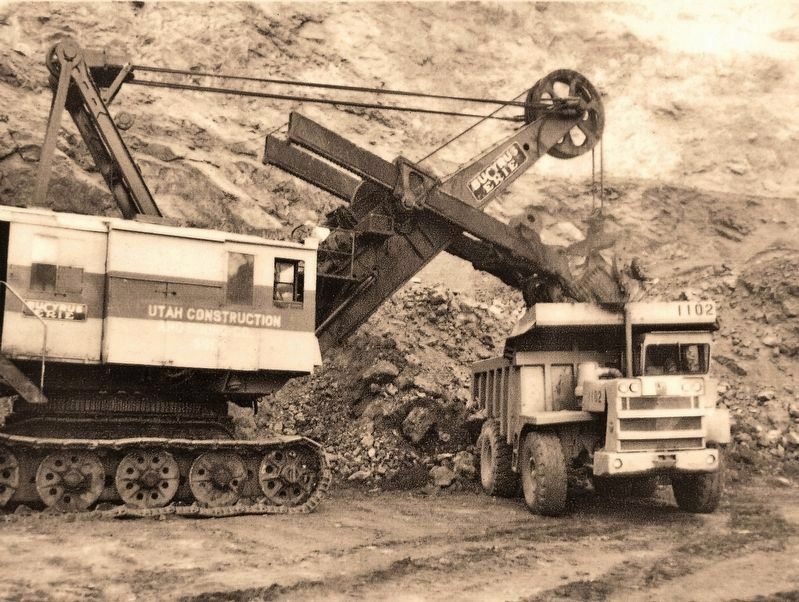 According to company delivery records, two Bucyrus-Erie 120-B shovels were delivered to the Utah Construction Company in Cedar City in September of 1936 for use in the iron mines. At the time, the hourly wage for a shovel operator was $0.48 per hour. 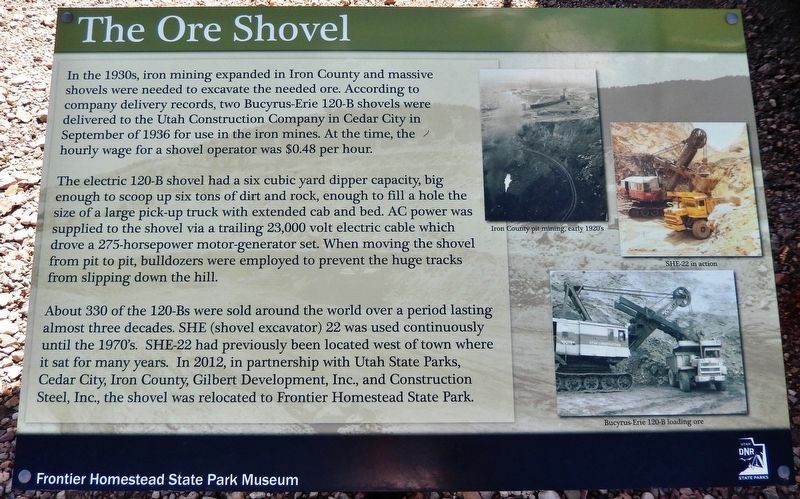 Construction Steel, Inc., the shovel was relocated to Frontier Homestead State Park. Erected by Frontier Homestead State Park Museum. Location. 37° 41.323′ N, 113° 3.732′ W. Marker is in Cedar City, Utah, in Iron County. Marker is on North Main Street (Utah Route 130) south of Iron Mission Parkway (West 685 North), on the right when traveling south. Touch for map. Marker is located within Frontier Homestead State Park, overlooking the giant Ore Shovel exhibit, near the museum front entrance on North Main Street. Marker is at or near this postal address: 635 North Main Street, Cedar City UT 84721, United States of America. Touch for directions. Other nearby markers. At least 8 other markers are within walking distance of this marker. Legacies of Iron County (a few steps from this marker); The Hay Derrick (a few steps from this marker); The Caboose (a few steps from this marker); Cedar City Historic Pioneer Cemetery Wall (about 800 feet away, measured in a direct line); Deseret Iron Works (approx. 0.3 miles away); Pioneer Iron Works Blast Furnace (approx. 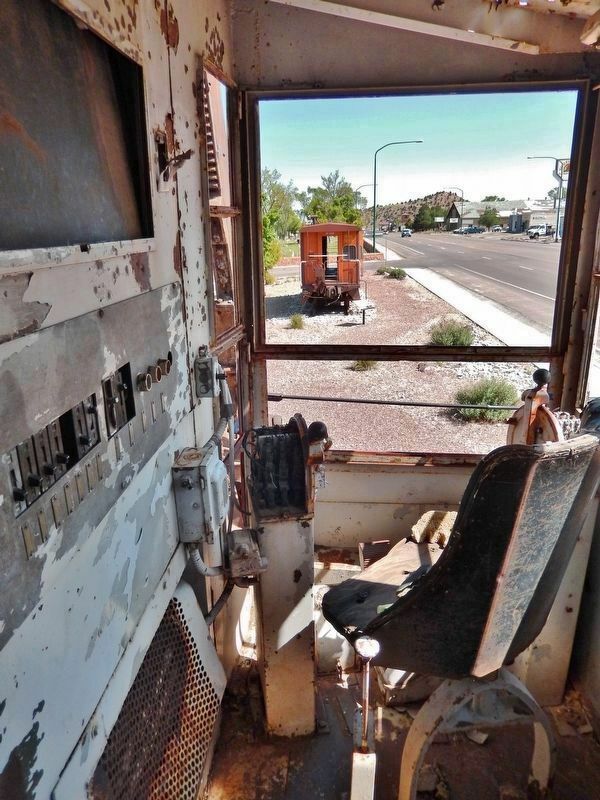 0.3 miles away); Cedar City Railroad Depot (approx. half a mile away); Escalante Trail (approx. half a mile away). Touch for a list and map of all markers in Cedar City. More about this marker. Marker is a painted metal plaque, mounted horizontally on a waist-high metal post. 6. 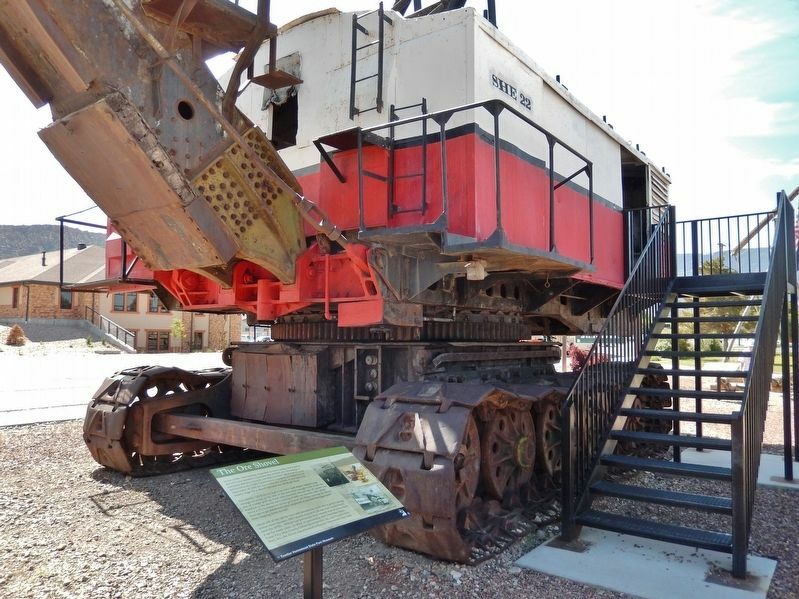 Bucyrus-Erie 120-B Ore Shovel "SHE-22"
More. 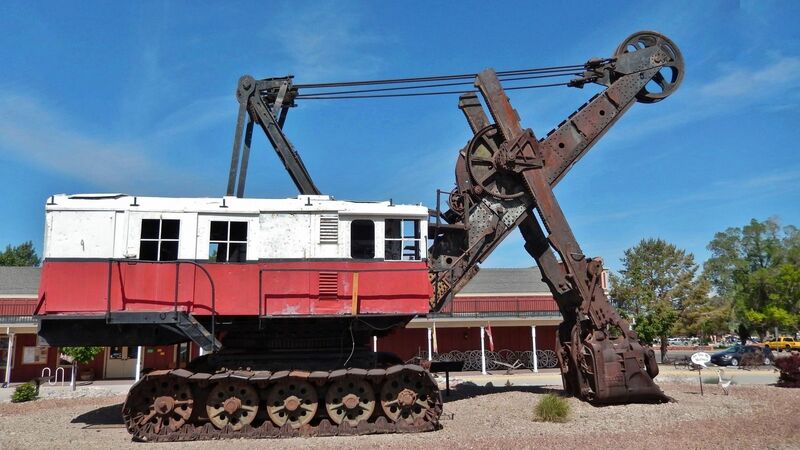 Search the internet for The Ore Shovel. Credits. This page was last revised on March 6, 2019. This page originally submitted on March 4, 2019, by Cosmos Mariner of Cape Canaveral, Florida. This page has been viewed 65 times since then. Photos: 1, 2, 3, 4, 5, 6. submitted on March 4, 2019, by Cosmos Mariner of Cape Canaveral, Florida. • Andrew Ruppenstein was the editor who published this page.